I agree with Howard, and this a splendid series of 'action photos'. One problem with the 'Mach 1' Tailored models was weight. Have you weighed the Gnat yet (without motor)? This statistic would be most useful for the archives. Now that's what I call progress, nice work. In trying to fly the Skyray mach 1 which Mike Stuart built from one of my kits, we didn't have perfect weather any time we tried it under power. However it did need the small elevons turned up quite a bit to get the nose up, but then would turn left or right for a short arrival. It did seem under-powered using the 50b even using the slightly more potent red spot fuel. Only thing we didn't try was a catapult launch. This would be a nerve wracking affair unless you were an octopus. One thing to remember is that profiles are notoriously different from scale beef, so be wary. These were the difficulties we encountered, but we're still here, still trying, and with all our fingers too... Rock on. 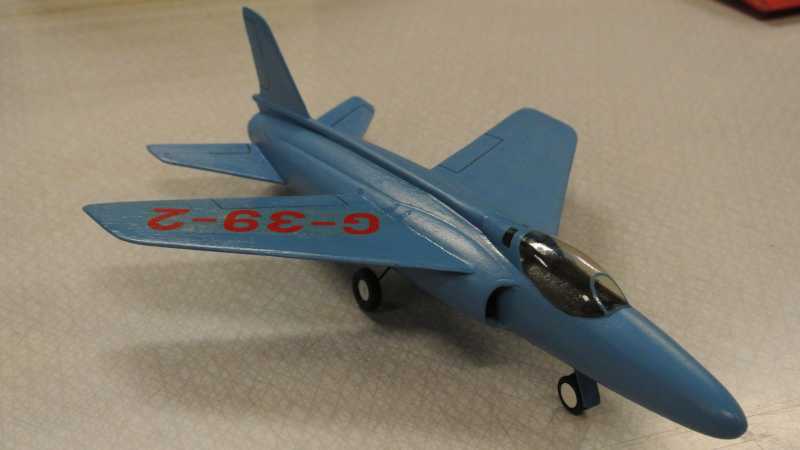 I had a look at Mikes homepage and the building of the Skyray, and it seems to be a lot more wood in that model. The wingspan is almost the same, 9 1/4" for the Gnat and 9 1/2" for the Skyray if I got it right, but so far the weight of my Gnat is around 28g with motor hatch and empty motor installed while the the Skyray seems to weigh 35.5g under the same conditions. I still have some more sanding to do before painting, and the paint should add less than 1g so I hope to end up around 29g. As you can see from the photos I tried to keep the keels as light as possible, what you can't see is that I also made the motor hatch hollow. The nose block is still massive, even though I thought about making it hollow as well, but I believe that the weight in the nose may be necessary, and I would hate to build it light only to end up adding weight again. I will make some more tests with the profile model, because I just realized that with the whole motor in front of the CG, the CG should move forward with loaded motor, and that may compensate for the tendency to rise and stall when starting. We have also been discussing the possibility to catapult launch it as a way to trim it without burning fuel, but then we will not se the effect from the shift in CG. Finally some progress, and finally blue! I started out with a few layers of dope and a lot of sanding in between, and the decided to try Tamiya acrylic paint, even though limited in blue nuances. Being a trained chemist I started out the scientific way, one part of this and two parts of that, until I got he right nuance, and after painting the model and letting it dry it came out completely wrong, so change of method. Pour in all the white there is, and se how it looks after drying. So I don't know if it is Nordic blue, but from now on it is Gnat blue in my book, and close enough to what I had in mind. Here is the final result with the canopy mounted, only missing some details and the decals. 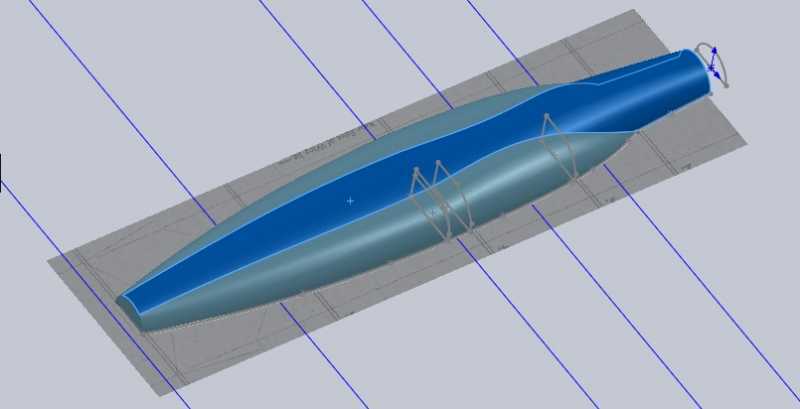 Meanwhile I have been playing with the 3D-cad to see if it would be possible to recreate the molds and make new fuselage halves. 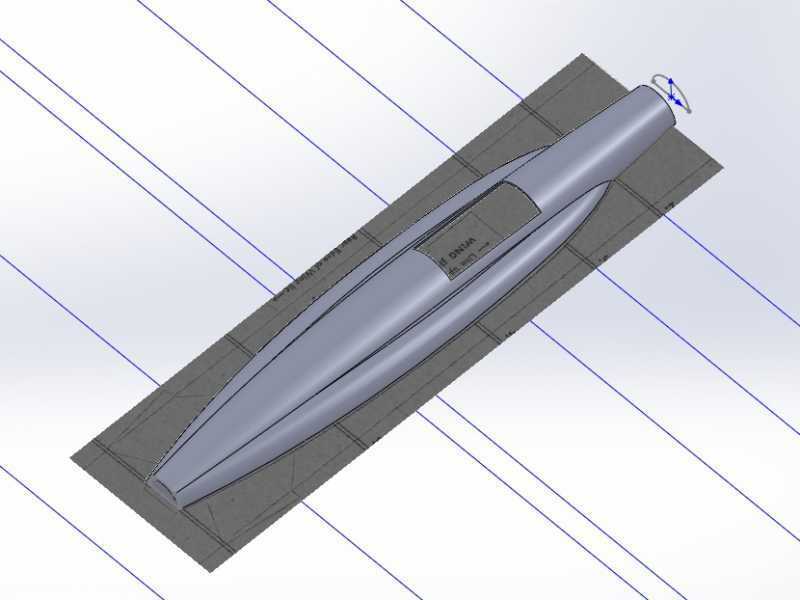 I have made the shells 1mm thick, and the cad program has a nice "Create mold" function that I will try eventually, but first I will start experimenting with a mold for an incomplete Skyrocket kit that I found recently, se my new topic here under the Building section. If I succeed, the next Gnat will be Red Arrows red! It seems that I did not fully meet my expectations on weight. While I hoped to end up under 30g with empty motor, it seems to be more like 31,5g painted and with canopy. Now with spring finally here i hope to start the flight tests soon.